It is fashion week once again, a feast of creativity in fashion and art. Fashion designers, bloggers, editors, buyers, even celebrities from all over the world get together to celebrate this festival twice a year! I could not stop creating fashion sketches inspired by them. I told to myself, I will treat this season of fashion week as an experiment. I am gonna get outside o my comfort zone to try different styles, mediums, and compositions and only following my heart instead of over thinking. Here are a few samples that I created this week. Please feel free let me know what do you think? 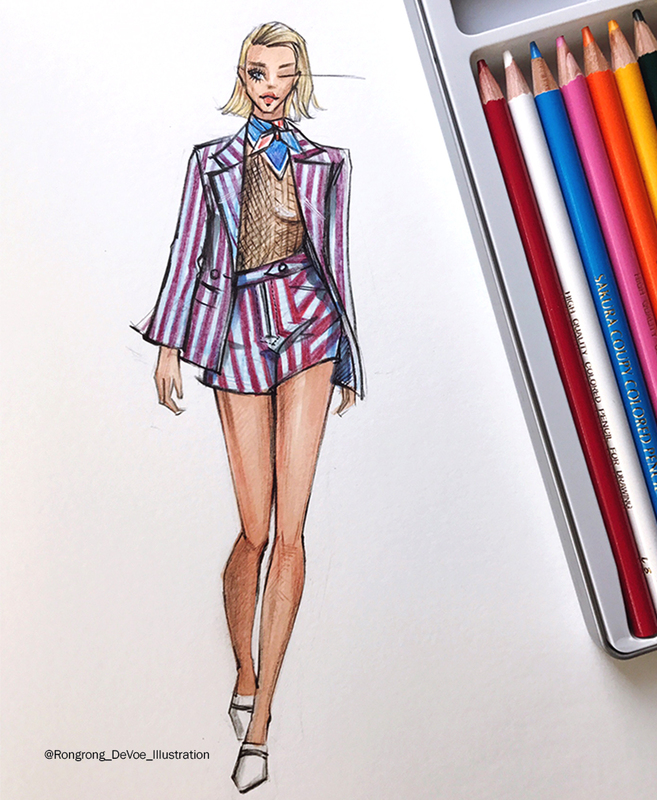 Inspired by SelfPortrait SS18 collection, I use four different mediums, including markers, watercolor, color pencils, gouache to create four different outfits from the collection. I use Vogue Runway as my references. Another one is for Anna Sui, she is one of my favorite Chinese American designers. Loving her bohemian style clothing so much! And the makeup was so pretty that I decide to do a piece that is more like a close-up collage. I use watercolor, paint pens to create and featuring GiGi Hadid, Taylor Hill. Another painting is inspired by Marchesa. I sketch their collection every season since I started drawing NYFW back in 2014. Always love their extravagantly romantic style. I painted the model in gold to show a luxury feeling and use watercolors for the gowns. I think watercolor always is my go to when it comes to illustrating very feminine materials. Now, what do you think? As an illustrator, I have often been told you have to have a unique style. But I don't always draw things using one style and I think it is a good thing. I go with what my instinct told me to use, depends on the objects, my moods and what I think maybe for a fun effect. I don't limit myself to one type of medium. And I recommend you to do the same. Explore yourself, there is so much potential in you!